Ford Focus RS RX: What The Hell Is This? Ken Block’s Gymkhana 8 was absolutely wild, with donuts around both a Raptor on its side and a giant airplane, but at the end, something weird happened. After the usual rolling of credits, we saw another car – one that Ford says was Ken Block’s Ford Focus RS RX. But we’ve never heard of that car before. And we like what we see, but mostly because we like the idea of putting what look to be massive radiators where the back seats should go. Right now, however, all we have to go on is what we see, until we get more information. So while we can only guess, let’s guess. The video captions read “& Introducing: Ken Block’s Ford Focus RS RX,” followed by “Coming Soon To Gymkhana 9.” And that’s it. 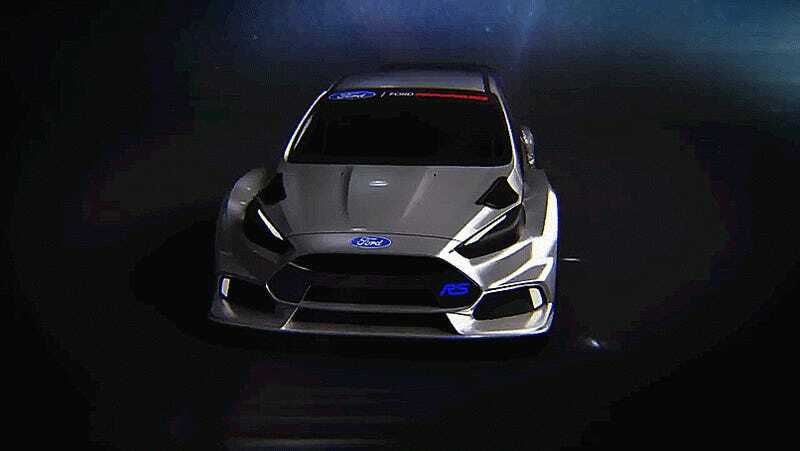 We already know the regular Ford Focus RS, but could Focus RS RX just be “The Car Ken Block Uses For His Next Gymkhana,” and nothing beyond that? It’s possible – Ken has a history of getting crazy one-offs for his Gymkhana specials, like the 845-horsepower all-wheel-drive Mustang from Gymkhana 7, known as the Hoonicorn. Or could it be something available to customers, likely for track-use only? Based on the flimsiest of evidence of all, which is the little contextual evidence we have, it says the car is “Ken Block’s,” which might imply that there are others, examples of the Ford Focus RS RX that are not Ken Block’s. Just as well, while it is a Focus, and not the Fiesta used in Gymkhana 8, it doesn’t look too radically different from the car used in 8, so why would it deserve an announcement a full year in advance? We didn’t see any announcement of the Hoonicorn at the end of Gymkhana 6. It also isn’t festooned with Block’s traditional eXtReMe energy beverage of choice as a livery. Or could it even be for the street? Unlikely, considering small matters of ground clearance and practicality, but hey, there’s precedent for a broiling-inferno-of-Hell-hot-lava-hatch to throw matters of practicality out the window. Just look at cars like the Renault Clio V6, enough though that would likely be lukewarm compared to a Focus RS RX. We’ve got e-mails in to both Ford and Hoonigan. Here’s hoping we’ll find out soon.